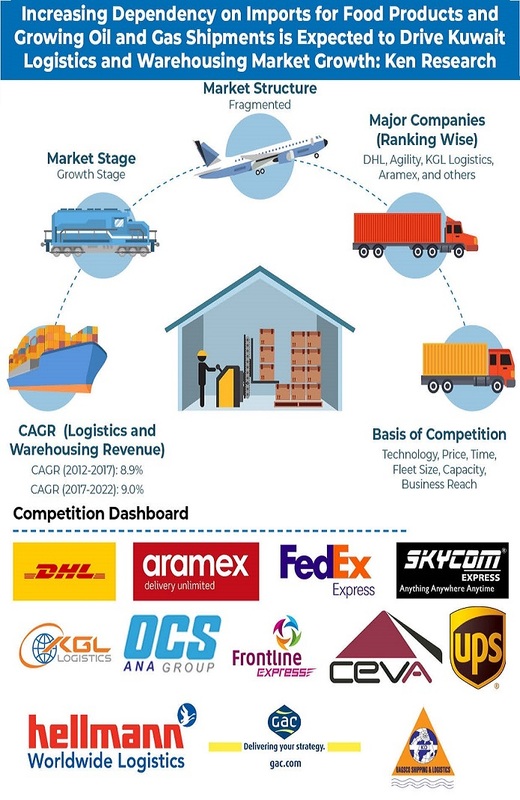 The report titled "Kuwait Logistics and Warehousing Market Outlook to 2022 - By Freight Forwarding/ Transportation, Warehousing and Value Added Services, E-commerce Logistics, Express Delivery, Third Party Logistics" provides a comprehensive analysis of logistics and warehousing services in the Kuwait. Kuwait logistics and warehousing market has witnessed increasing demand of maritime, aviation and land transport systems to ensure efficient flow of resources and commodities within the country as well as to other countries globally. Kuwait is majorly focusing on improving its trade relations which led to the growth in import and export in terms of value and volume. As trade has a direct correlation with logistics industry, the market has grown positively during the review period. Kuwait logistics and warehousing market augmented positively at a positive single digit CAGR during the review period 2012-2017. The growth of freight forwarding in Kuwait was supported by development in major industries such as oil and gas, manufacturing, retail, wholesale, construction, agriculture and mining. The Kuwait market witnessed the entry of many foreign players as flexible policies were introduced by the government to boost the economic growth of the country. Sea (Inland Waterway and maritime) dominated in freight movement in freight forwarding market in 2017 due to major cargo transportation taking place through ocean such as oil and gas. Air contributed second highest revenue share to the freight forwarding market majorly driven by the express shipments in the country. On the other hand, road contributed the least share and is generally used for the domestic shipments. International freight forwarding dominated the freight forwarding industry in Kuwait owing to the free trade agreements of GCC with European Free Trade Association and Trade and Agreement Framework Agreement with the US. There are approximately 55 courier companies in Kuwait which provides normal delivery service. The freight forwarding industry in the country is moderately fragmented with the presence of both domestic and international players in the industry. Companies in the Kuwait have been focusing towards providing data oriented solutions and other services for operational excellence, timely customer support and the effective adherence of the consumers’ expectations, thus providing customer satisfaction and retain customers. Asia flow corridor is the largest contributor in terms of revenue in the freight forwarding market. It was followed by Europe, North America, GCC and other flow corridors. Over the forecast period, the Kuwait will witness construction of many new roads and bridges which will aid against the traffic congestion problem in the country and positively affect the trucking industry, hence aiding the domestic logistics. Kuwait warehousing market in terms of revenue and capacity grew at a positive CAGR during the period 2012-2017. Industrial freight/retail dominated warehousing market in 2017 in Kuwait due to rise in the industrial and retail sectors in the country. Container freight followed the industrial/ retail freight as the use of containers in export shipments makes the transport and goods handling easier and faster. Cold storage warehousing has inclined over the years with the rising requirement of temperature controlled products majorly (pharmaceuticals, sea food and frozen foods). Agriculture and others attributed least share in warehousing. The warehousing companies in Kuwait observed to compete with each other on the basis of the size and location of the warehouse. Other important factors which influence the choice of warehouse are technologies/automation used in the warehouses; value added services, GDP-certified temperature and humidity-controlled environment and others. The companies will focus towards technologies such as RFID, automatic retrieval system, robotics, drones and others in future which will further boost the demand for warehousing services within Kuwait. Express delivery services in the logistics and freight forwarding market of Kuwait has emerged as a critical variable in the growth of the overall market in the past five years. Road express has been a major contributor to the express delivery market in terms of revenue and has accounted for maximum revenue share during the period. Kuwait express delivery market has been dominated by international express which comprised majority of the market revenue during the year 2017. In terms of revenue, B2B segment has dominated the Kuwait express logistics during 2017. In Kuwait, express delivery market is largely dominated by major global players such as DHL, FedEx, Aramex, UPS and others who collectively contribute to the majority of revenues in the international express delivery market in the country during the year 2017. The “last mile” delivery step to the consumer will gain more importance in future due to the rising share of B2C parcel logistics in the market. The Kuwait E-commerce industry has witnessed a positive growth over the past three years with an increase in internet penetration into the country. In terms of total number of shipments, E-commerce merchant through in-house logistics have captured the majority of the market share in terms of the total number of shipments in the year 2017. It was witnessed that international E-commerce companies prefer to outsource logistics to 3PL companies to avoid the obstacles in establishing their own operations. Same day delivery within five hours has dominated the market in terms of number of orders owing to increasing focus of the companies on providing better services coupled with increasing customer needs for better service. The E-commerce logistics industry was observed to be concentrated with the presence of major players such as Aramex, DHL and FedEx covering around majority of the market share in 2017. 14.11. KUEHNE + NAGEL Co. W.L.L.